Adhesives, while invisible to the end user, are perhaps the most significant component in the manufacturing process as they bind all the other components together and play a key role in the durability of the end product. The right adhesive formulation is the difference between a successful end product and a wide range of manufacturing and product performance issues; and, influences whether or not the end product is recyclable. Adhesives come in a variety of formulations and their unique characteristics determine whether the end product is recyclable. Natural glues, when purchased as consciously as eco-friendly papers, inks, labels, packaging and other materials can deliver a high quality, recyclable end product and move you closer to achieving your company’s environmental sustainability goals. When choosing the raw materials required to produce a product, eco-conscience manufacturers consider not only their costs and usage, but the environmental impact the raw materials have both pre and post production. 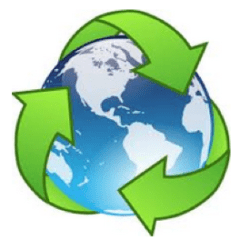 The lifecycle approach to manufacturing considers numerous factors such as the environmental impact of virgin raw materials, energy consumption and efficiency, product performance, recyclable characteristics, transportation, distribution and disposal. Incorporating natural, recycled raw materials in your manufacturing process makes invaluable sense when considering the positive impact it has on the environment. This approach is referred to as using rapid renewables; and, it’s how manufacturers turn “trash” to treasure. Adhesives produced from renewable materials span a product’s entire lifecycle, minimize energy use, water consumption and aid in the recycling process. Utilizing adhesives produced with rapid renewables as part of your production process will increase your eco-efficiency. While we all want to do our part for the environment, it’s not always possible; when this is the case, we suggest you consider one of the many synthetic adhesives we offer. Synthetic adhesives are available in a variety of compositions. We have created an ever developing adhesive product line, founded on technical innovation and cutting edge formulations. While every component of the manufacturing process is important, none are as important as the adhesive which binds them all together. Adhesives’ role in industrial manufacturing is imperative; it is overwhelming to think of all the industries which utilize some form of adhesive. Very few consumers think twice about how a product is assembled; over 90% of consumer products utilize some form of adhesive. Many world renown products are manufactured using Olympic Adhesives’ products: board games, puzzles, furniture, leather goods, luggage, musical instruments, albums, books, directories, stationery, file folders, binders, abrasives and textiles to name a few. Let Olympic Adhesives customize a solution for your specific application.